I am new to weaving, I may not use the correct terminology and I do hope you have the patience to bear with me. I think I am in need of an 8 dent reed as the Shetland wool I am using for my warp is getting worn rather badly by my 12 dent. Would you advise if I’d be better off with a 10 dent reed for my projects? I am also using Shetland wool for the weft and only getting 8 (rows?) per inch. I’ve only made one shawl so far but look forward to many more projects! A couple of things…..it sounds like you are weaving plain weave with that Harrisville and if so, you might want to change the epi to 10, which would help you get 10 picks per inch and balance in your cloth. I like to weave Harrisville a little open on the loom because if fulls so much when it is washed. I think that weavers need to have a couple of reeds and my favourites are 6, 8 and 10. You can print a reed substitution chart off the website that will help you use the reeds wisely. 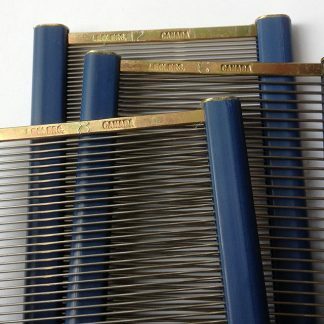 Across the top of the chart in bold numbers are the most common sizes of reeds available (except 15 and 18 are really for very fine yarn). Under each number there is a column with other numbers progressing from small to larger numbers. Those number are all the possible ends per inch that you can get from that reed if you sley it in different ways. The next thing you will notice is a set of numbers out in the left hand column. Those numbers tell you how to sley the reed to get the epi in the reed. 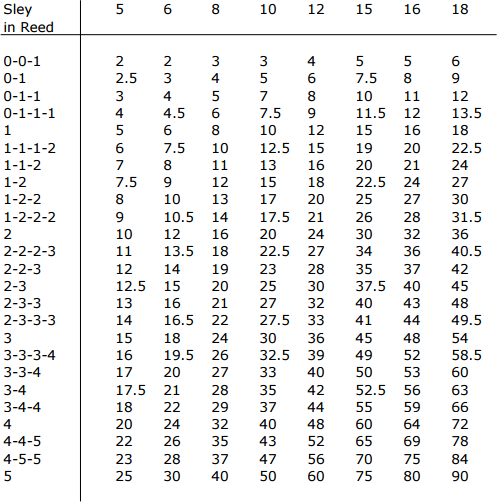 Here’s a reed substitution chart for quick reference. Click here to view the JST Reed Substitution Chart in PDF format.